Due to its geography, topography and location on a barrier island, the Town of Seabrook Island is vulnerable to a number of potential disasters including, but not limited to: hurricanes and tropical storms; earthquakes; tsunamis; tornadoes; pandemics; power and utility losses; and winter storms. ​​The town has recognized these vulnerabilities since its incorporation in 1987 and has addressed them periodically through various policies, ordinances and public information campaigns. 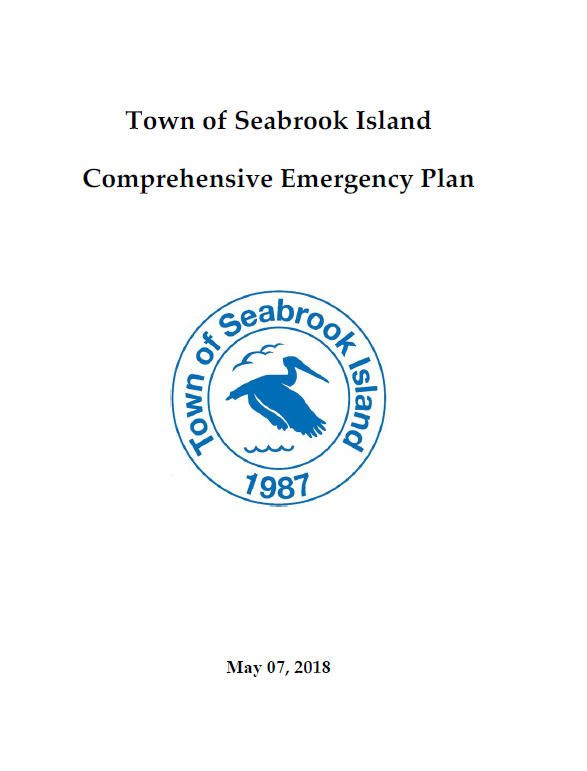 In 2009, Seabrook Island Town Council decided to expand upon these efforts by compiling and adopting a Comprehensive Emergency Management Plan. The purpose of this plan is to better prepare for, respond to and recover from a variety of emergency or disaster events in an effort to mitigate risk and ensure continuity of operations. This plan is not intended to address the individual responsibilities of the town's residents or property owners, or those of other entities, such as the Seabrook Island Property Owners’ Association (SIPOA), Seabrook Island Club, Camp St. Christopher or Bohicket Marina and Market. The plan was developed using recommended best practices from the National Fire Protection Agency (NFPA) 1600 and the Disaster Recovery Institute International (DRII). A comprehensive risk assessment and business impact analysis provided the foundation for future planning efforts. Specific strategies and fundamental elements of response and recovery plans were devised collectively through a series of planning meetings with the Mayor, Town Council, Town Administrator, Utility Commission and other individuals as necessary. The Public Safety Official, along with the Public Safety Committee, are responsible for maintaining, updating and testing the plan, and for recommending follow-up actions to the Mayor and Council. The Executive Official (Mayor) is the chief individual responsible for overseeing all activities related to the event. The primary responsibility of the Executive Official is decision-making. This individual must gather information from all other officials and available sources, and make critical decisions during the course of the event. The Operations Official is responsible for directing and managing all operations related to the response and recovery phases, including supervision of all staff, contractors, and other personnel involved with the response and recovery efforts. The Public Safety Official is responsible for overseeing the necessary steps to ensure the safety and well-being of the town’s residents, visitors, staff and any other individuals within the town limits at the time of a disaster or emergency event. The Communications Official is responsible for directing all communications from the town during an event. These responsibilities include internal communications between town leaders, staff and other officials, as well as external communications to the public and outside agencies. The Logistics Official is responsible for maintaining the town’s list of approved vendors to support response and recovery operations. The Logistics Official will oversee all aspects of the town’s use of these vendors during an event. The Resources Official is responsible for maintaining a list of available resources within (or near) the town which may be used during an emergency situation. The Resources Official also serves as a resource to assist any of the other officials in any capacity. The Utility Official is responsible for overseeing all emergency operations of the town’s utility plant, its contractor and the recovery of other basic utilities serving the town.